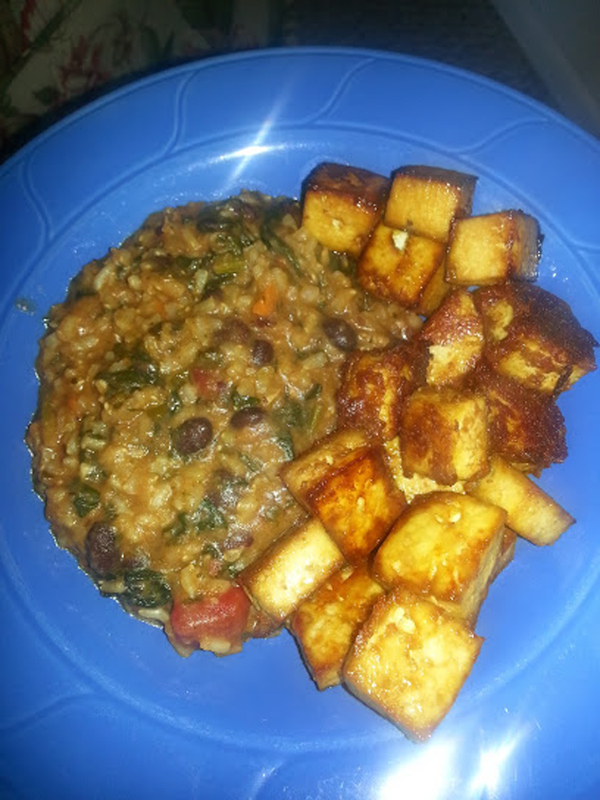 I created this recipe (pictured above with baked tofu) years ago when I first took a crack at going vegan. Now, this dish not only serves my vegan lifestyle, but is a crowd-pleaser for my carnivorous friends and family! Even my little picky nephew loves this hearty stew. This will make a great addition for those #MeatlessMonday everyone’s hashtagging about! Step 1: If using dry black beans, soak overnight. If using canned, rinse first. Step 2: Prepare rice according to package. It’s okay if it’s a little hard still. Step 3: While rice is cooking, chop onion finely and set aside. Chop celery, carrots, zucchini and potato in small chunks and set aside. Step 4: Heat large pot on medium heat with buttery spread and allow to melt. Add onions. Cook until they are soft before adding all the other vegetables. Stir frequently and cook for a couple of minutes. Step 5: Add vegetable broth to the pot. Stir for a minute. Add black beans and drained brown rice. Season mixture with salt, pepper, onion powder, Onion Soup & Dip Mix packet. Keep stirring as you add ingredients. Step 7: Add Salsa and cook for a few minutes. Step 8: If mixture is too dry, add a cup of water. To cut some acidity or spice, add sugar. Simmer for thirty minutes, stirring occasionally. Serve this stew hot, cold or at room temperature! You can even serve it with tortilla chips as a dip. Enjoy! ← Brandon Chase Talks Debut Single, The Voice and Living Life Half Full!